We are pleased to announce the release of version 10.2 this week. This release includes a much needed enhancement to the ITTO Explorer. The ITTO Explorer now supports history tracking and deep linking. What is browser history tracking and deep linking? In simple terms, each Project Management Process and Input, Tool / Technique, and Output (ITTO) now gets its own unique link. As you navigate from one item to another on the ITTO Explorer, the browser URL changes, and the browser keeps track of the history for your entire session. This means you can now use the browser’s Back and Forward buttons to jump back and forth between the items. For example, let’s say you are on a Process, and you click and open one of its inputs. As you open the input, the browser URL will change. In order to go back to the Process, you simply click the browser Back button to go back to the Process. This wasn’t possible earlier. In addition, you can also use your browser to bookmark any Process or ITTO. You can copy and paste the links to Processes and ITTOs into your study notes, and directly jump to them from your notes by simply clicking on the links. In future, we plan to make Process and ITTO names in Flashcards and Exam modules as hyperlinks so that you can quickly jump to a Process or ITTO to see its details as you review your exam answers or study the flashcards. Ability to use browser Back and Forward buttons on the ITTO Explorer to navigate back and forth on Processes and ITTOs. This would help in maintaining context during your study sessions. Bookmark a process or an ITTO for quick reference. 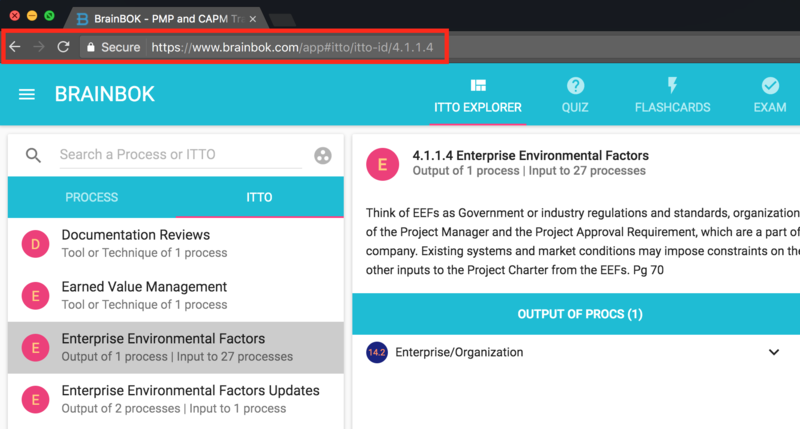 Embed links to any Process or ITTO in your study notes in order to quickly jump to it for reference while revising the notes. We hope that you find the new feature useful. Go ahead and give it a try, and let us know what you think of it using the comments box below. We also welcome your ideas to further exploit this feature.